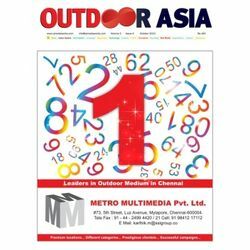 Outdoor Asia started as a Quarterly in April 2002 as Outdoor Today and moved to become a bimonthly under the current name in 2005. In April 2007, the publication became monthly covering all the facets of the Out-of-Home industry. Outdoor Asia focuses on original news, features, latest trends in new technology, the best creative works, new campaigns, research and analysis about OOH advertising. The magazines reach into the world of Out-of-Home Advertising is unrivaled. This newly revamped magazine is the key source of information and opinion for media owners, advertising and marketing executives. This magazine reaches subscribers who are key decision-makers and influencers at advertising agencies, major brands and media buying agencies.